Europe is back in the game. Having suffered the worst financial and economic crisis of the last 80 years, Europe took decisive action to improve its public finances, push through deep reforms, and establish new institutions to manage and prevent crises better. The changes are structural, long-lasting and make Europe more competitive. Europe is stronger, better equipped and in the midst of ambitious new financial and economic initiatives. The global crisis hit Europe twice. The first strike came from abroad in 2007. In the United States, markets had ignored credit risk in subprime mortgage markets. A lack of financial supervision allowed opaque financial instruments to flourish, aggravating the problem. As a result, the U.S. banking system underwent a dramatic bail-out in September 2008. European banks suffered in the fallout. Two years later, a second crisis erupted in the euro area. Years of unsustainable government policies had caused deficits and debt burdens to mushroom and bloated pre-crisis wages and housing prices. As the situation worsened, Europe took courageous decisions to put the continent back on firm footing. 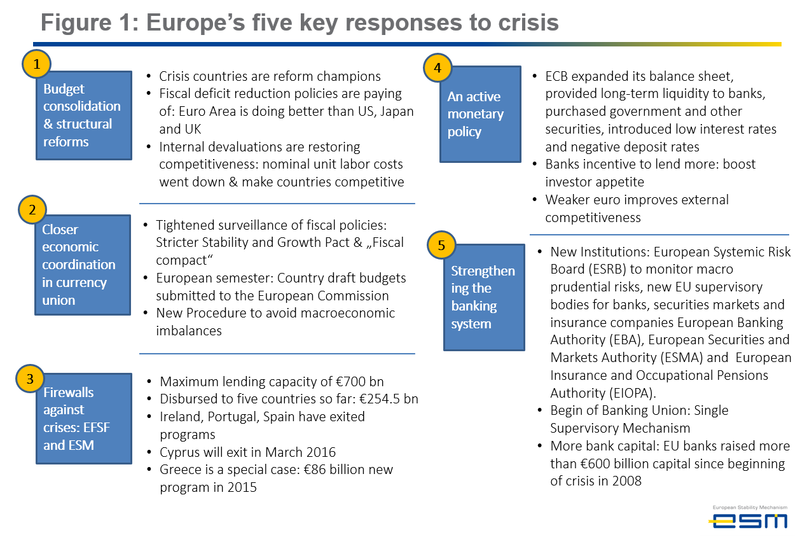 Five key responses combined to steer Europe out of the crisis (figure 1). First, crisis-hit countries like Ireland and Spain pushed through badly needed reforms, improving public finances and increasing competitiveness. Second, EU economic governance was strengthened. The European Commission received new powers to enforce the Stability and Growth Pact, issue country-specific recommendations (the ‘European semester’), and underline obstacles that need to be removed to foster growth. Eurostat, Europe’s statistical agency, became more powerful in cross-checking and challenging the data received from each country. Third, euro area countries created the European Stability Mechanism (ESM), and its predecessor the European Financial Stability Facility. These institutions were a great success: no country was forced to leave the euro area, the cash-for-reform approach worked, and growth accelerated in countries that implemented reforms. Importantly, no European taxpayer money was spent on the rescue programmes. The ESM raises the funds needed in capital markets through highly-rated bonds, and passes on the low funding cost to programme countries at rates today of around 1-2%. This approach produces budget savings for programme countries, particularly Greece, which would pay much more if it were to tap capital markets independently. Fourth, the European Central Bank’s unconventional measures helped. The ECB expanded its balance sheet like the FED, Bank of Japan and Bank of England, provided unlimited liquidity for banks, started a bond purchasing programme to avoid low inflation, which also made it easier for banks to lend and boost investor sentiment. The euro weakened which helped to increase exports. Finally, the Banking Union was established: new institutions were created to monitor macro-prudential risks and supervise banks, securities markets and insurance companies. The Single Supervisory Mechanism is the centrepiece of this initiative; it oversees the 130 largest euro area banks. During the crisis, EU banks also padded out their capital, increasing their capital base by €600 billion since 2008. The results are impressive (figure 2). The crisis-hit countries implemented radical reforms. They now head multiple international rankings, earning the sobriquet ‘reform champions’. 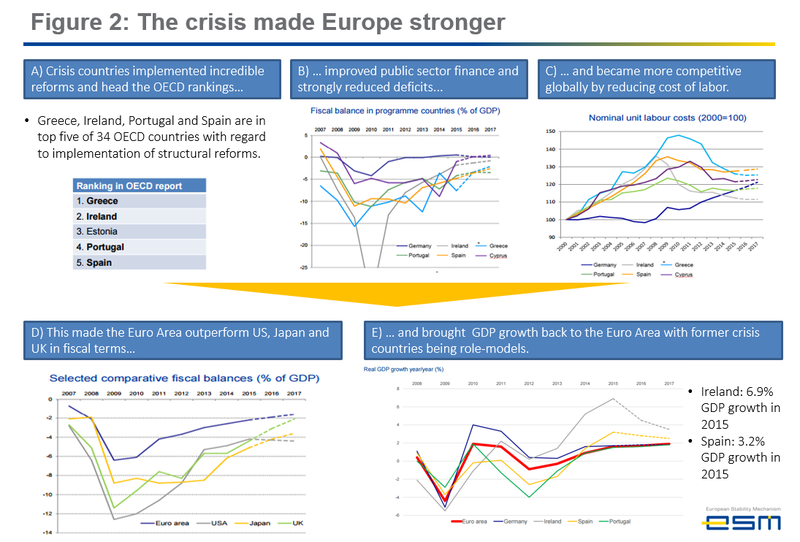 Many of Europe’s crisis countries – Greece, Ireland, Portugal, and Spain – ended up in the top five of 34 OECD members (a club for the most developed countries) in recognition of their structural reforms. They did so by improving their public finances, reducing deficits, and cutting labour costs to make themselves more competitive. The euro area outperformed the US, Japan and the UK in fiscal terms: the aggregate euro area budget deficit was significantly smaller than these three peers. And finally, some of the crisis countries are becoming growth leaders. In 2015, Ireland hit a record high 6.9% GDP growth and Spain 3.2%. Ireland’s growth matched China’s, while Spain’s is almost a third again as high as the US’s (2.5%) over the same period. These are extraordinary achievements. Europe’s Banking Union is moving forward. On 1 January 2016, the new European mechanism to resolve failing banks went live. The Single Resolution Mechanism’s (SRM) goal is to resolve distressed banks at the lowest cost to taxpayers. It includes the participation of the private sector, such as shareholders, junior and senior creditors and unsecured and very large depositors, according to the bail-in rules under the Bank Recovery and Resolution Directive (BRRD). Additionally, SRM-covered banks will most likely need to provide €55 billion in funding over the next eight years to create the Single Resolution Fund (SRF). While this means higher costs for banks, it reduces the need for taxpayers to cover bank failures. The final step to completing the Banking Union is a common deposit guarantee scheme similar to the US’s Federal Deposit Insurance Corporation (FDIC). This year, a European Commission proposal to establish a European Deposit Insurance Scheme (EDIS) has been hotly debated. The aim is to guarantee individual deposits of up to €100,000 at all banks in the euro area – benefiting around 340 million citizens in 19 countries. It is far from a done deal, but if agreed and implemented, the US and Europe will share a similar approach to supervision, stress testing, resolution, and deposit guarantees. With the Banking Union advancing at high speed, Europe launched another big project last year: the Capital Markets Union (CMU). The CMU’s goal is to create deeper and more integrated capital markets. Traditionally, Europe has been dominated by bank financing: when an entrepreneur needed funding, banks were the go-to partner. During the crisis, banks tried to reduce their risk exposure and, as a result, financing for entrepreneurs, small- and medium-sized enterprises (SMEs), and some corporations, dried up. The CMU aims to address this issue. The differences on the two sides of the Atlantic are large. Banking Union bank assets total €30.2 trillion compared to just $13.4 trillion in the US, a gap explained by the source of financing (figure 4). 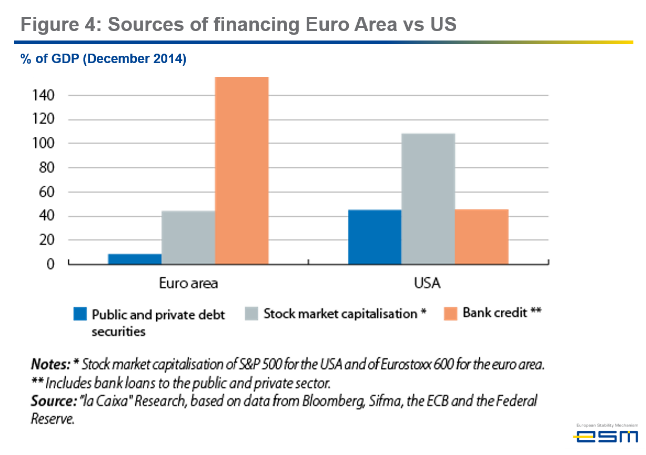 Euro area banking credit reaches some 170% of GDP, against only 45% of GDP in the US. Stock market capitalisation and debt securities are respectively some 45% and 10% of GDP in the euro area compared to 110% and 45% in the US. The CMU initiative could transform Europe’s capital markets over the 2016–2019 period. The CMU is designed to reduce dependency on banks. It should increase the flow of funding from Venture Capital to Private Equity, to IPOs and eventually to equity and debt capital market financing. It aims to standardise prospectus legislation across countries (currently there are large differences across European countries, not to mention the different language requirements), deepen the covered bond market, develop a stronger securitisation market, align bankruptcy laws, and stimulate more cross-border capital investments. Despite the challenges, Europe has strong foundations to build on. It is home to some of the largest pension funds in the world and countries with strong household savings habits such as Sweden, Germany, and the Netherlands. The Presidents of the European Central Bank, Eurogroup, European Commission, European Council and European Parliament presented a plan, the Five Presidents Report, to further deepen Economic and Monetary Union over the next 10 years, or through 2025. 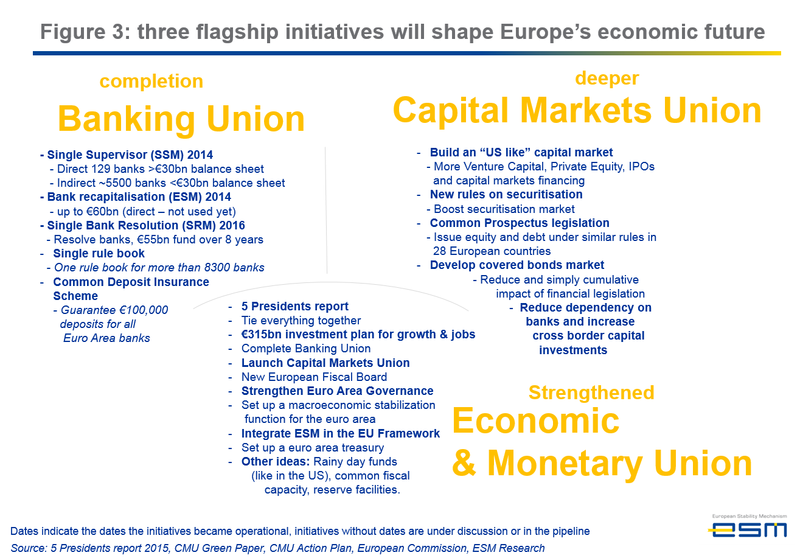 The goal is to pull all these initiatives together, complete the Banking Union, make progress on the Capital Markets Union, and introduce new initiatives for the euro area. These initiatives could include establishing a new fiscal council for the euro area, a euro area macroeconomic stabilisation function, or even a euro area treasury. Combining these initiatives has one big advantage: it would allow for more risk reduction and better risk-sharing across the euro area and reduce the need for the public sector to use taxpayers’ money for economic and financial shock absorption. In the US, economic and business cycles are smoothed out across the 50 states to a much greater degree than in Europe, with market mechanisms doing the lion’s share of the work (figure 5). Fiscal transfers play only a limited role. About 75% of economic and business cycle shocks in the US are smoothed, 62% by financial market transactions and only about 13% through fiscal transfers and taxpayers’ contributions. 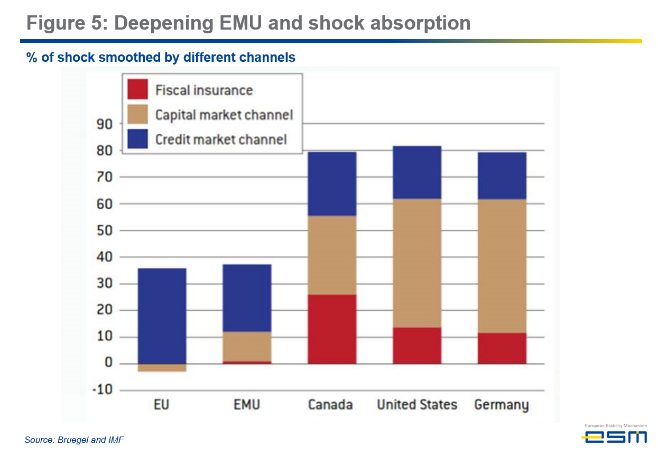 This underscores how important it is for Europe to complete Banking Union, deepen CMU, and strengthen the EMU. These three big initiatives, if implemented successfully over the next five to 10 years, will define Europe’s economic future in the long-run. There are some headwinds, including the migrant crisis and the June 2016 UK referendum on EU membership. European policy makers, enterprises and citizens need to turn these events to their advantage. Immigration can stimulate growth, with a small but positive short-term impact on EU GDP. It can also help compensate for weak long-term demographics. If executed well, the benefits could be significant. Take Germany for example. The country has around 81 million citizens today, but that figure is seen declining 13% to 67 million by 2060 (figure 6). This will hit economic growth. It will also undermine the sustainability of public finances, as the share of over-65-year-olds rises to 33% in 2060 from 20% and puts pressure on the pay-as-you-go pension scheme. According to the German Statistical agency, more immigration could bring the population to 73 million by 2060. At today’s GDP per capita, that difference of six million people means €210 billion in GDP potential. However, the devil is in the detail. Europe must protect its outer borders well, bring in the right skill sets, and provide successful economic and social integration programmes. Managing the fear of immigration and growing populism present the biggest challenges. Countries that know how to manage most of these elements well, like Canada and Luxembourg, have reaped the rewards. The UK referendum and similar discussions in other member states are an important part of a healthy democratic process, but it is essential to consider the implications. 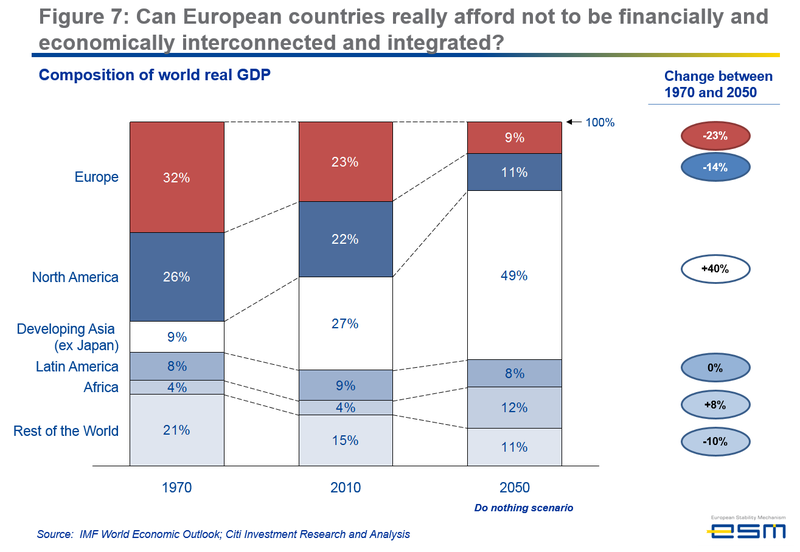 Can European countries really afford not to be financially and economically interconnected and integrated? Europe’s percentage of global GDP declined to 23% in 2010 from 32% in 1970 (figure 7) and, if no new policy initiatives are undertaken, could fall to 9% by 2050. This will have an enormous economic, financial, and geopolitical impact. Europe, and North America, will decline in size and influence. To counter this trend, further integration, not fragmentation, is needed. Europe’s best way forward is to stay together as a strong, well-integrated, and deeply interconnected continent. Over the past 70 years, Europe has achieved unprecedented peace, stability, and wealth creation. It is the world’s largest single market. It is in its best interests to remain the global financial and economic leader. Europe not only endured the last crisis, it capitalised upon it. Europe’s five key policy responses meant the continent emerged stronger. The results, such as in Ireland or Spain, are impressive. Completing the Banking Union, deepening the Capital Markets Union, and strengthening Economic and Monetary Union will make Europe’s economy more competitive, diverse, and robust. It is crucial that Europe not deviate from this path and that it continues to turn headwinds, like immigration, into opportunities. Europe has put together the building blocks for a bright future; its citizens can justly be proud of these achievements. Realising this ambitious agenda will make Europe stronger, more influential, and ensure it maintains its position as an economic powerhouse.